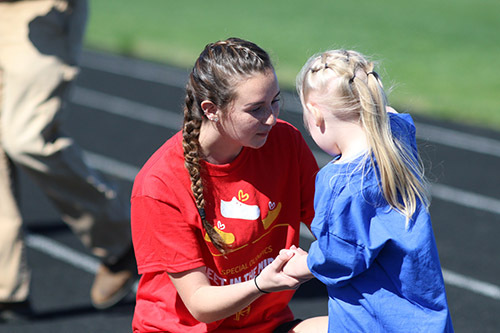 Senior Abby Warren helps an elementary student at the Meet In The Middle 2019 event. Photo by Monica Thompson. The annual Little Feet Meet, now called Meet In The Middle, was held on Wednesday, April 10th, at N.B. Clements football field. 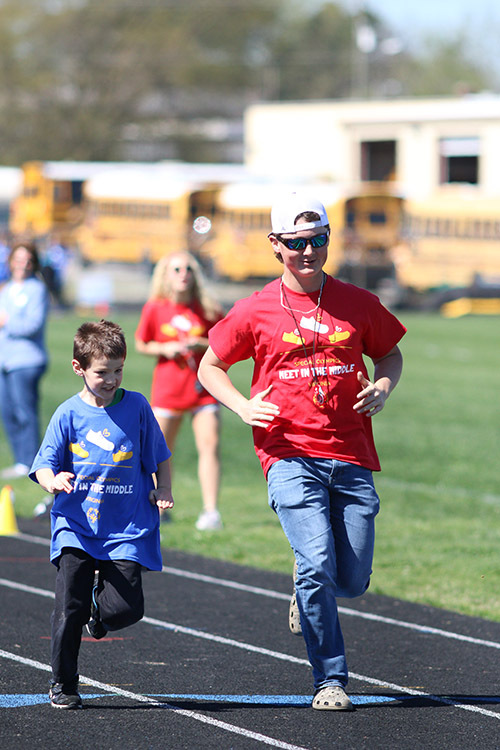 It was hosted by Special Olympics and it included elementary schools from all over the county. This year, kids from all over Prince George County could participate in the event. “Last year it was just elementary schools. 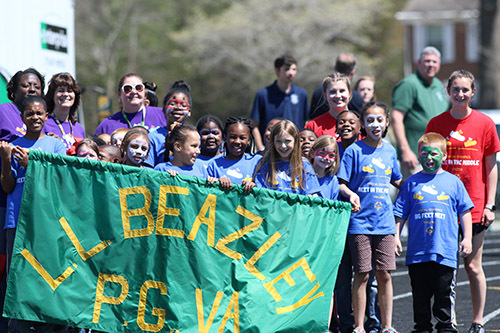 It was called Little Feet… this year’s it is called Meet in the Middle and involves all of the schools here in Prince George County and it has turned out to be a wonderful event,” Sherri Jones said. 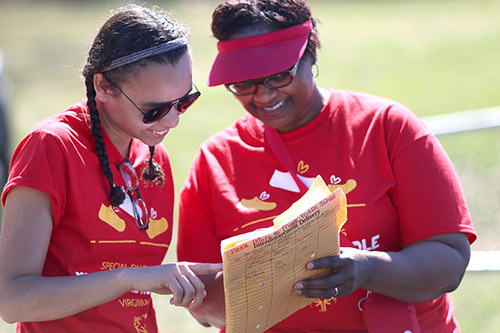 Champions Together sponsor Sherri Jones discuses the schedule of events with senior Jordan Dockery. Jones is the sponsor for Champions Together and has helped prepare the event. Her and other student volunteers attended from Prince George High School as part of the Champions Together Club to help with everything from the stations to the food. “I was the ambassador for the South Elementary School. I showed the kids around and we had a really fun time,” sophomore T’Angela Munoz said. Munoz was one of the many students who helped with the event as being an ambassador for South Elementary school. She guided her group of students around to each station as well as walked them down the entry and exit ceremony. While the ambassadors guided the children, other volunteers were in charge of helping the children at the stations. “It is such a great event because the goal is to bring our special-needs students together with our non special-ed students and general ed students and the purpose is to bring them together to form friendships, tear down barriers that might have been there due to their disability. So forming new friendships,” organizer Mr. Hall said.